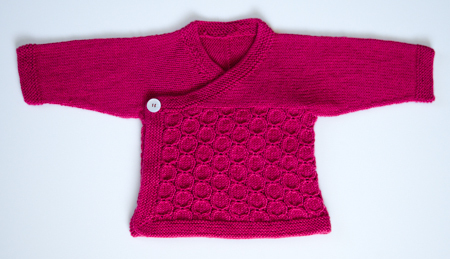 Pattern: Temari Kimono Jacket from the Scrumptious Baby Collection, published by Fyberspates Luxury Yarns, designed by Kyoko Nakayoshi. I poked around the web, and found that the cheapest and most convenient way to purchase this pattern for me was to buy the book on Amazon. I followed the pattern for the smallest size, meant to fit a 3 month old. My gauge was a little bit different, so the finished sweater’s dimensions are closer to the 6 month old size. What a lovely little sweater! 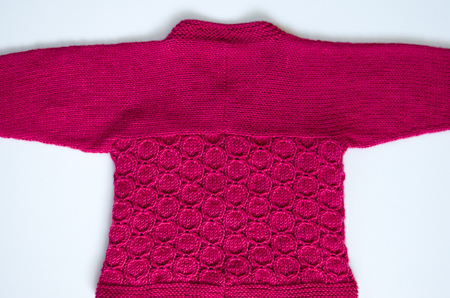 I love how grown up the finished sweater looks, both in terms of style and color, and yet it’s meant for a baby. I also loved knitting this pattern – the construction is very interesting, and definitely kept me on my toes, especially through the upper portion of the sweater. The lower portion, with its “medallions” formed by cables, was also fun to knit, and went by quickly when cabling without a cable needle. I purposefully chose a round button, to complement the “medallions.” It’s hard to see it here, but it’s pearly and has some interest. Yarn: Louet Gems sportweight in #26, crabapple. I’ve used this yarn tons before, and this particular color as an accent here and here. This sweater was knit using 2 100-gram skeins. Needles and finished measurements: as recommended in the pattern, US 3 and 5 circs. The finished measurements are: 19″ chest circumference, 6.5″ sleeve length to underarm, 11.25″ shoulder to hem. Here’s the back of the sweater, subject of a previous blog post. I’m pretty happy with the three-needle bind-off. It’s very smooth and non-bulky, and the stitches picked up for the lower portion of the sweater are nice and straight. Maybe I’d try grafting next time and sacrifice the evenness of the picked up stitches? 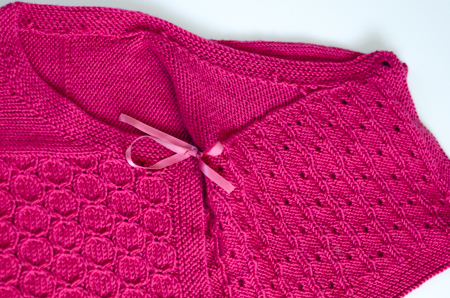 The pattern contains instructions for making some crocheted chains to keep the inside of the sweater closed. I chose to sew on bits of ribbon instead, and sealed the ends with some Fray Check . So pretty! Love the color, too. That is a very interesting stitch pattern! It almost reminds me of little coins..
Am I finally going to be in time to make a comment? I keep wanting to say how adorable everything (especially that Gregory) is, but missing the boat. This sweater is indeed a winner! Very, very attractive. Such a great color. really sweet cardi and the color is fabulous! now i need to check out that book. What a lovely little sweater! Very pretty color. The work is gorgeous as well. Beautiful sweater – lucky little baby! And I was too late to comment on your earlier post about the chenille quilt. I’m so impressed with all of it & am sure the mom is thrilled too. This is a lovely piece. I will have to add it to my queue of pretty baby knits. Now that I’m having my own, baby clothes manage to be even more potato chip like than ever before.